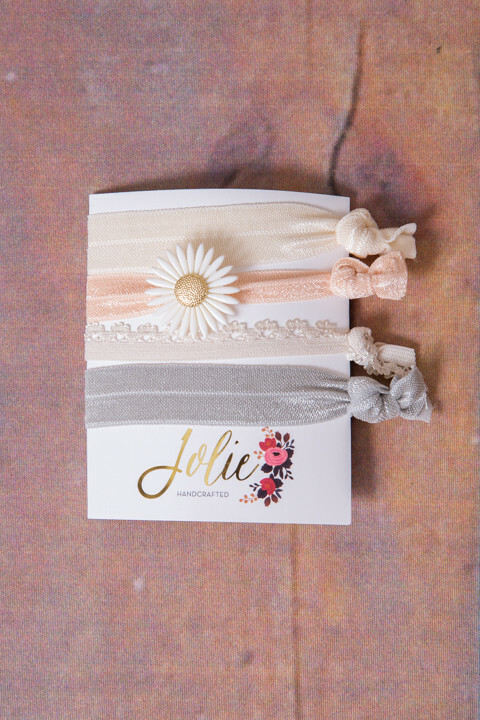 The Daisy Knotties are the perfect little hair ties and consist of a pack of four. The light pink tie has a daisy charm on it while the ivory tie is trimmed in lace. There are also a plain grey and ivory tie. These are not your traditional ponytail holders, because these will not pull or dent your hair. The ties are made from soft and stretchy elastic that have been hand cut and knotted. You can also wear them as a bracelet. Made by Jolie. Handcrafted in the USA.